MTF Biologics understands and respects the importance of individual privacy and security. We are committed to protecting your privacy and safeguarding your personal information. MTF Biologics will not collect any personally identifiable information about you (e.g., your name, address, telephone number or email address) through our website unless you have provided it to us voluntarily. 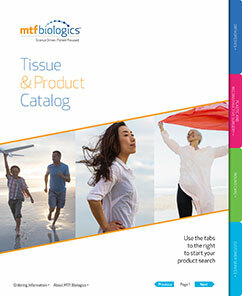 MTF Biologics does not use any programs or applications to capture e-mails or IP addresses from visitors to our website. Your participation is voluntary and we will not require you to provide more information than is necessary for the purpose of communicating information pertaining to our organization. By providing your email. you are giving us consent that we may periodically send you information relating to MTF Biologics, including information on programs, services, press releases, legislative issues, and news stories. We do not use any personal information you supply us for a profit. We do not now and do not intend to sell, rent or market personal data about you to any third parties for any reason whatsoever. Access by our employees and agents to your personal information is only on a need to know basis on the understanding that this is confidential business information .